Vane Lindesay 1993 by Francis Reiss. Gelatin silver photograph. 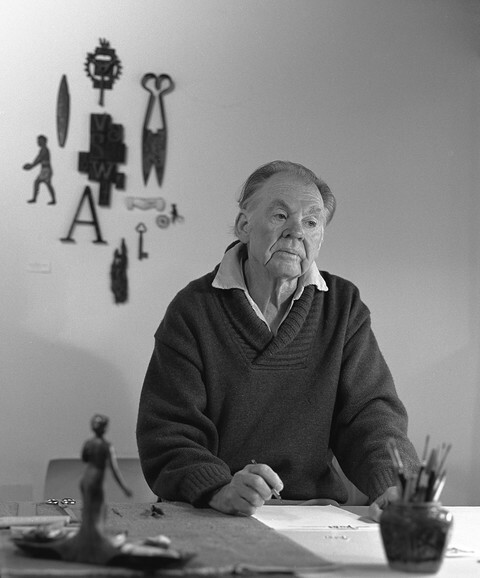 Cartoonist, illustrator, writer and book designer, was born in Glebe, Sydney on 2 October 1920 but has mainly lived in Melbourne, where he still resides. Lindesay served as a signalman with a machine-gun regiment in Darwin during WWII then for the last three years of the war was on the art staff of the Australian Army Education journal Salt, where he became senior artist. After his discharge in 1946 he worked briefly for the Melbourne Herald then spent three years in England, followed by a career on the staff of the Melbourne Argus until it folded in 1957. In 1979 he was said to have had cartoons in the Australasian Post for 25 years. A pioneer historian of Australian cartoon history, Vane Lindesay’s essays and features on Australian cartoons and cartoonists, as well as his own cartoons, have been published (among others) in The Age, Inkspot, Overland (for which he was design editor for years), The Australian Book Review, The ADB, The Australian Encyclopaedia and The World Encyclopaedia of Cartoons and Cartoonists (20+ entries in the Australian section). During the 1980s Vane’s work regularly appeared in the Bulletin. He has won many awards for his book designs as well as his cartoons. His cartoons have been published in England and America and exhibited in Japan and Canada. A long-serving committee member of the Australian Black and White Artists’ Club (1994), he was at times president and vice-president (Vic.) for almost thirteen years, until handing over to Ian McCall in November 1996. He won the Bulletin Black and White Artists’ Award in 1988 and The Australian Book Publishers’ Award of Honour in 1991. Sourced from Design & Art Australia Online.